Scrambled Eggs and Rosemary Potatoes topped with your choice of Beans, Vegetables, Cheese, Salsa & Sour Cream. 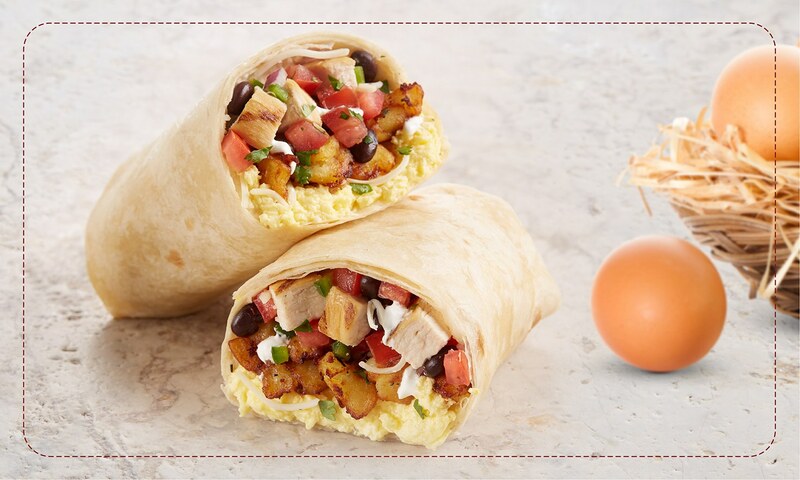 Choose Chipotle Chicken or Spicy Barbacoa, then custom build your own Fresh Mex Burrito or Breakfast Bowl. Scrambled Eggs, Rosemary Potatoes, Pico De Gallo Salsa, Fajita Vegetables, and lots of melted All-Natural Cheddar and Jack cheeses. Add Chipotle Chicken or Spicy Barbacoa Beef to your Breakfast Quesadilla.